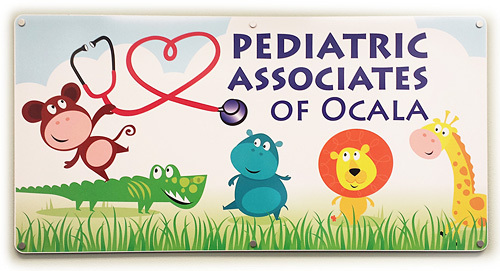 Pediatric Associates of Ocala is a family-oriented pediatric practice providing comprehensive medical care to newborns through adolescents. Ear Piercing, New born Circumcisions, Check Up / Vaccine, Newborn - 5 years, annually 6-18 years. Flu Vaccine available at 6 months. Pediatric Associates is committed to providing you with the best possible care and will be pleased to discuss our professional fees with you at any time. is a family-oriented pediatric practice providing comprehensive medical care to newborns through adolescents. Our mission is to promote both the physical and mental well-being of all children. Pediatric Associates has been proudly serving the families of Ocala and Marion County for over 20 years since Dr. Bruce Kraut founded the practice in 1995. During the past seven years, Dr. Stephanie Harrell, Dr. Dana Daley, Dr. Rena Harrington, and Erin Clymer, ARNP, have joined the practice and helped make it the friendly, professional practice it is today. As of June 2016, Dr. Amy Johnson and Dr. Edythe Park will also be joining our practice! We are a medical family of board-certified pediatricians, nurses, and staff members, all of whom are dedicated to providing the highest quality healthcare to your child. At Pediatric Associates, we understand that choosing a pediatrician is a very important decision for both you and your child; and we pride ourselves in paying close attention to your child’s needs. We believe there is no greater job than to care for and nurture our community’s children and we look forward to the opportunity to help your child grow from infancy to adulthood.